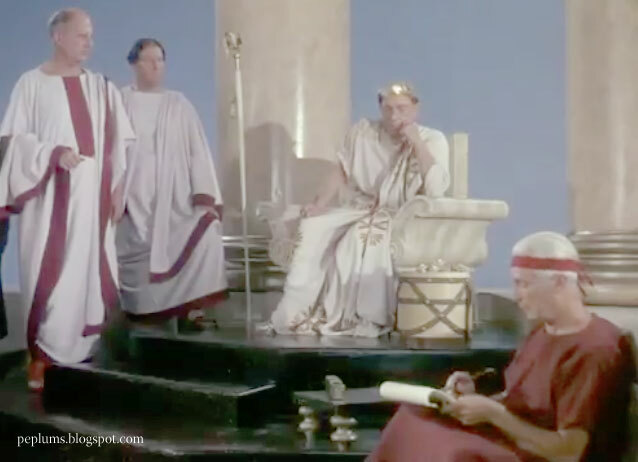 In the screenshot above from SIGN OF THE GLADIATOR, Georges Marchal is secretly listening to some conversation going on inside the tent. This shot shows how the tent's material and rope and attachments are too modern and not the kind one would find in Antiquity. In SALOME, Cedrick Harwicke is supposed to be sitting on a marble chair on top of a marble platform but when the actors walk on the steps, you can hear it's wood and hollow. The wood was painted to make it look like marble. Because it's an audio goof, you have to take my work for it. Every time I see this scene the illusion of grandeur is shattered: cheap wood. They could have easily fixed this in post production.